who are waiting for these kind of Jobs can go through the GPNL official notification www.graminpashupalan.com. Open the web link and search for current job to which the candidate willing to apply. Fill the complete information given in the application form and submit before 05-11-2017. Candidates having 10th/ 10+2/ Graduation qualification is required to apply for GPNL Vacancies. Method of selection is based on candidates performance in Interview. Detailed Age limits, Relaxations and Qualifications are mentioned in the Notification. After final selection candidates will be offered fixed monthly salary as per Govt rules. 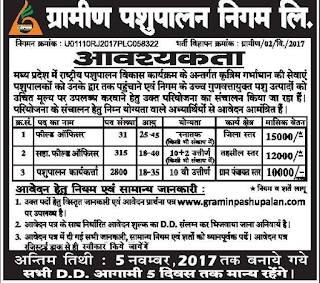 Other information related to Selection Process, Application Procedure, Age Limits, Pay Scale, qualification of Gramin Pashupalan Nigam Limited GPNL Assistant Field Officers and Animal Husbandry Workers (Pashupalan Karyakartha) Jobs are mentioned below. 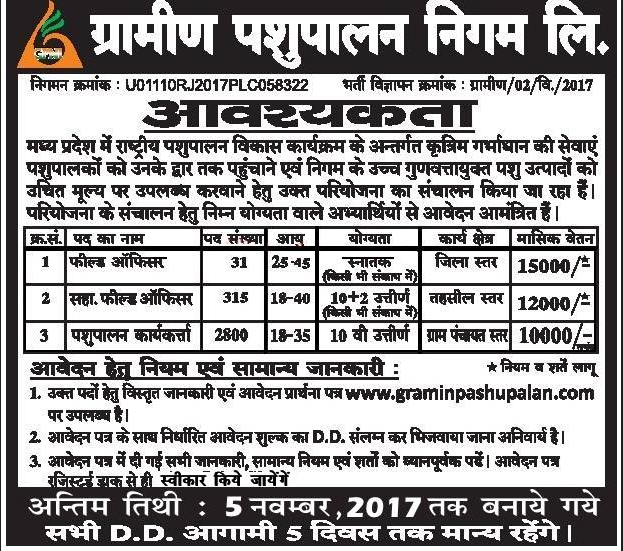 Total no of posts available in Gramin Pashupalan Nigam Ltd GPNL Recruitment are 3166. 1. Field officer: 51 posts. 2. Assistant Field Officer: 315 posts. 3. Animal Husbandry Worker: 2800 posts. 1. Field officer: 00 posts. 2. Assistant Field Officer: 00 posts. 3. Animal Husbandry Worker: 00 posts. Field officer: Graduation qualification is required. Assistant Field Officer: 10+2 pass qualification. Animal Husbandry Worker: 10th class pass qualification. For detailed qualifications visit GPNL Notification. Age limit for GPNL Recruitment vacancies are as follows. -FO: 25 years to 45 years. -AFO: 18 years to 40 years. -AHW: 18 years to 35 years. Selection for GPNL Recruitment is on merit basis in Personal Interview held by the Gramin Pashupalan Nigam Selection board. Willing candidates for these Field Officer Jobs can go through the GPNL official website www.graminpashupalan.com. Get the application for particular post. Fill the required fields and submit before 05-11-2017. For more updates regarding GPNL application process see the notification.